I first met with Allyson, Pam (Mother of the Bride) and Carly (sister and Maid of Honor) in December of 2007; they were referred to me by the wonderful Robyn Jones of the Hilton Netherland Plaza. (A year out may seem far to some people for “week-of coordination”, but with professional consultants “day of” and “week of” often starts at minimum a month out, and many of us offer unlimited email and phone contact throughout planning, starting from the moment you sign on). Allyson was so “on it” even that far out – she already had the majority of her major vendors booked, and I could already tell it was going to be a great night! Allyson and Michael, Amanda and I had such fun working with you and your wonderful families! We hope you enjoyed your wedding as much as we did and then some! Congratulations! I just got an e-mail from Patti Needham of Take-One Studio, letting me know about a new service they are offering, the “Bridal Bailout”. It is a stripped-down version of their fantastic wedding videos, for brides who know they want an excellent wedding video but are being cost-conscious due to the economy. Come meet the lovely ladies of Brideface at The Bridal Studio on February 15th from 12-4. What a perfect opportunity to sample professional makeup, have some munchies and mimosas and hobnob with other brides. Nancy, Mollie, Jenny, Jasmine, and Penny will all be there showing off their skills! Have you always wanted to see what you look like in false lashes? Dying to try a smoky eye? Toying with a retro look to go with that birdcage veil? Looking to pick up a few tricks or tips? Maybe you are just on the fence about whether you want to hire a pro for the Big Day. Here is your chance to play! Tell all your engaged friends that this is where they need to be. Sunday, February 15th from noon to 4 at 714 Madison in Covington (direction available on The Bridal Studio’s website). RSVP to Nancy@brideface.com or on their Facebook page. The Newport Aquarium (Currents Ballroom) is hosting a free bridal open house on Sunday, February 22nd, from 3pm – 6pm. All future brides and their guests are invited to attend! Each bride will receive a Currents remembrance gift…and be eligible for some great door prizes. You can sample complimentary hors d’ oeuvres from their exclusive caterer, Cuisine by Jean-Robert, and also enjoy a special wine tasting. Meet several of Newport Aquarium’s preferred vendors including florists, photographers, DJs & others. If you are looking for that unique space, then you should attend this event! 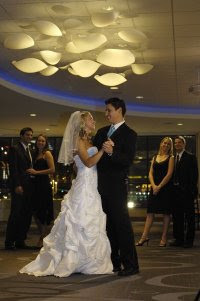 Currents Ballroom offers your guests an extraordinary experience they’ll never forget. Enjoy breathtaking views of the Cincinnati skyline and the Ohio River through their floor to ceiling windows or from their outdoor deck. Depending upon your desired setup, Currents can provide seating for up to 240 guests for dinner or up to 200 guests for dinner and dancing. Interested attendees can RSVP by calling 859.815.1427 or emailing Margaret at mtimmins@newportaquarium.com. I will definitely be attending, and I hope to see you there!